Perry Hicks, is a rising junior majoring in chemistry at Mercer University in GA. She was awarded a National Science Foundation ( NSF) Research Experiences for Undergraduates (REU) fellowship by the University of Rochester (UR) chemistry department to work in the DeLouise Lab this summer. 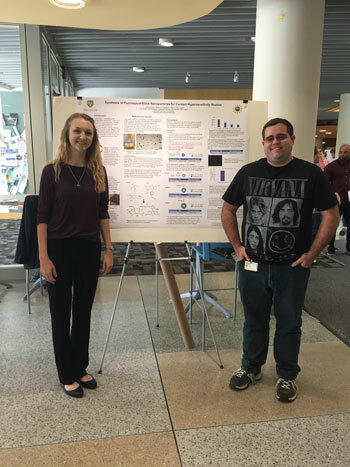 Under the mentorship of Brian Palmer, a graduate student in the UR Toxicology program, she synthesized and characterized fluorescent silica nanoparticles. These nanoparticles are used to modulate skin immune responses and the fluorescent signature is helpful for tracking skin penetration and translocation. Dermatology associate professor, Lisa DeLouise, MD, MPH, gave a 'Science Cafe' talk last night entitled, "Skin and the Environment: Things You Should But Probably Don't Know". 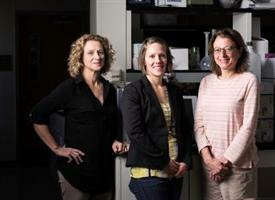 The DeLouise Bio Nanomaterials Group manipulates materials on the micro, nano and molecular level scales to design biomedical devices for diagnostic, therapeutic and investigative studies of skin. Our multidisciplinary approach integrates experimental research and simulation to design devices that exploit the novel optical, morphological and surface chemical properties of nanostructured materials. Key focus areas include optical biosensing, microfluidic cell sorting and cell culture and nanoparticle skin penetration, skin imaging, translocation and targeted delivery. Science Cafes are interactive events involving face-to-face conversations with leading scientists about relevant current topics. This one meets on the fourth Tuesday of the month in the Community Room on the second Floor of the Pittsford Plaza Barnes and Noble.